A number of cases of serious child abuse have resulted from beliefs that children may be possessed by evil spirits and may then be given the power to bewitch others. Misfortune, failure, illness and even death may be blamed on them. The 'cure', nowadays called deliverance rather than exorcism, is to expel the spirits, sometimes by violent means. This book draws together contributions on aspects of possession and witchcraft from leading academics and expert practitioners in the field. It has been put together following conferences held by Inform, a charity that provides accurate information on new religions as a public service. There is no comparable information publicly available; this book is the first of its kind. Eileen Barker, founder of Inform, introduces the subject and Inform's Deputy Director goes on to detail the requests the charity has answered in recent years on the subject of children, possession and witchcraft. 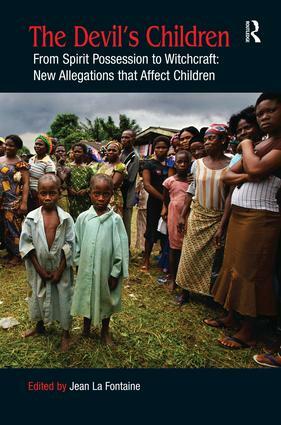 This book offers an invaluable resource for readers, whether academic or practitioner - particularly those in the fields of the safeguarding of children, and their education, health and general welfare. Contents: Introduction: An introduction to The Devil's Children, Eileen Barker; Beliefs in possession, Amanda van Eck Duymaer van Twist. Part I The Meaning of Possession: Possession states, Roland Littlewood; Embodied alternative identities: spiritual possession, psychiatric disorder or socio/political stratagem?, Sherrill Mulhern; Possession and deliverance in a British Pentecostal church, Malcolm Gold; The jinn, black magic and evil eye among East London Bangladeshis, Simon Dein; The practice of possession in Haitian vodou, Bettina E. Schmidt. Part II Possession as Contact with the Divine: Possession as a sacrament: the perspective of Wicca, Christina Harrington; Possession in the Celestial Church of Christ, Mercy Magbagbeola. Part III Children Accused: Child witches in London: tradition and change in religious practice and belief, Jean La Fontaine; At risk, as risk: abandonment and care in a world of spiritual insecurity, Filip de Boeck; Child abuse linked to accusations of 'possession' and 'witchcraft', Eleanor Stobart; The impact of spirit possession on the child's mental health and social work intervention, Amma Anane-Agyei; 'Project Violet': addressing the practice of faith and/or belief based ritualistic abuse of children, Robert Pull; The Christian church and child protection - an overview, David Pearson; Further reading; Index. Professor Jean La Fontaine, Ph.D. Anthropology Cambridge is a Research Fellow of Inform, and Professor Emeritus at the London School of Economics. She has carried out anthropological fieldwork in eastern Uganda, Kinshasa (Democratic Republic of the Congo) and in England. She has taught anthropology at Birkbeck College London and the London School of Economics. Her most recent book, Speak of the Devil, concerned allegations of devil worship in England. She is currently studying accusations of witchcraft against children in London.